Hi, Cesena! I am David, hello. I’m sorry, I don’t speak Italian. Only a little, a little. That video – but how beautiful! Very beautiful. Thank you very much [literally: a thousand thanks]. We are arriving [coming], I promise. We’ll see each other soon. Thank you very much. I love you. Bye. What better way to celebrate a great rock anthem than to play it alongside 999 other musicians? Fabio Zaffagnini from Rockin'1000 clearly had the same idea. The Foo Fighters haven't been to Cesena, Italy since 1997, so Zaffagnini concocted a plan to change that. 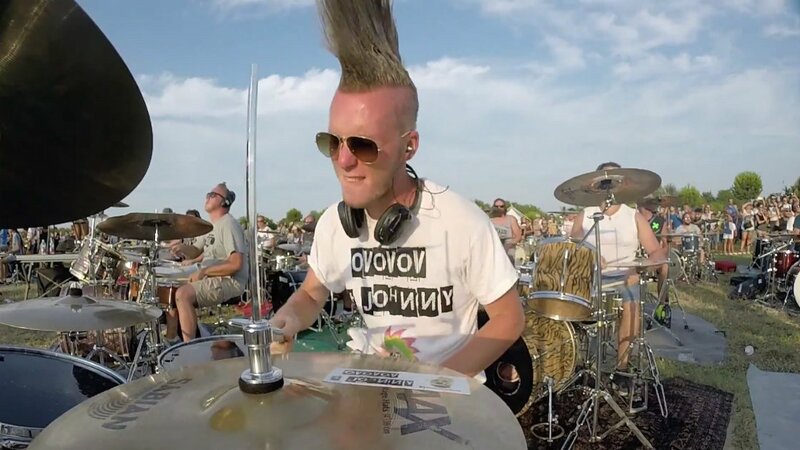 The plan involved auditions and crowd funding, until the moment came when hundreds of musicians were selected to perform Foo Fighter's "Learn To Fly" for one epic performance guaranteed to make you smile. The performance totaled 1000 musicians, all learning the music and lyrics to a great rock anthem in hopes of getting the attention of the Foo Fighters. Countless drummers are arranged in tidy rows, numerous guitarists sway back and forth, and singers crowd around a single microphone, all under the guidance of a single conductor. Cameras pan over the entire field, capturing everyone's endless energy and smiles. The video wraps up with a few words from Zaffagnini, summarizing the projects journey, and a request for Foo Fighters to visit Cesena. Check out the video and Grohl's response above. Foo Fighter's latest album, Sonic Highways, is available on Amazon (Blu-Ray/DVD, Vinyl, CD, MP3). You can also stream it for free here on Zumic. For Foo Fighters's latest music, news, and tour dates, check out their Zumic artist page.